At Billy Goat Moving & Storage in Fort Collins, we know that people move for all kinds of reasons. The change that comes with relocating can be overwhelming for some, but what about a move that’s the result of another big life change? When you need a moving company that will make sure your belongings arrive safe and sound, no matter where in Colorado you’re going, you can count on us to get the job done. Big life changes can come at any age, but in this post, we’ll look at three of the most common – college graduation, marriage, and the passing of a loved one. If you’ve spent the last four years studying and learning, working toward your college degree, then you probably can’t wait to get out there and start your career. The time and money you’ve invested have helped you land the job of your dreams, and the only problem is that you’re going to have to move to a new city. If you’ve just graduated from CSU in Fort Collins and your new job is in Denver, then you can either commute or move closer to work. Commuting can get expensive, and it may make more sense to find a place in the metro area. You and your special someone have been in love for what seems like forever, and you’re finally both ready to take the plunge and get married. You’ve spent the last few months planning, and the big day is fast approaching. Hopefully you’ve put some thought into where you’re going to live! Maybe you’re finishing up school while your significant other is already working (or vice versa) and you want to find a place that’s good for you both. While wedding planning and starting your marriage off right are more important, it’s good to think about where you want to live and whether you’ll have to move to get there. This big life change is more of a somber one, and it often comes when you’re older. However, no matter how old you are, the passing of a loved one is never easy. If you have a spouse or partner who dies, you may have to move for financial reasons or to be closer to family. If you have a parent who passes, you may be tasked with moving some things out of their house, or helping your remaining parent find a new place to live. Whatever the case may be, it’s good to have a reliable moving company by your side to help you. 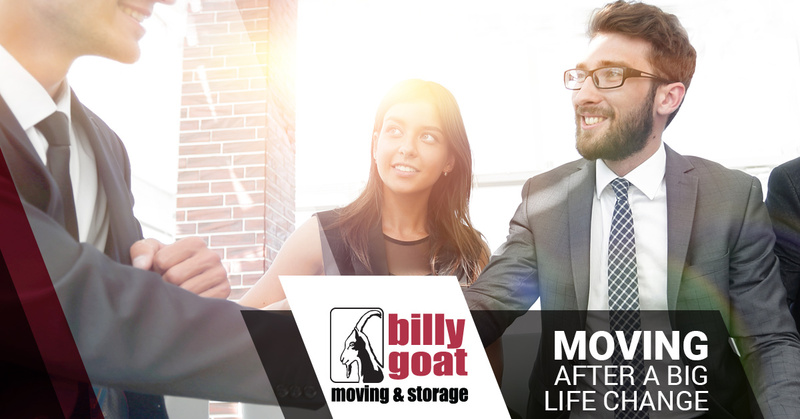 At Billy Goat, we’re dedicated to helping every customer have an enjoyable moving experience. We proudly serve all of Colorado, so if you’re relocating for a job, or another big life change is causing you to have to move, then you can count on us. Contact us by using the form below, or by calling us at (970) 541-9121.